This report will rank the items based on the value sold in the period specified. Sometimes such a report is referred to as an “ABC” analysis or a “pareto” analysis. Statistics show that 20% of the items supplied by an organisation usually generates 80% of the total value of sales. Therefore, it is useful (and wise!) to concentrate first on the 20% of items that are most important. This report makes it easy to do just that. 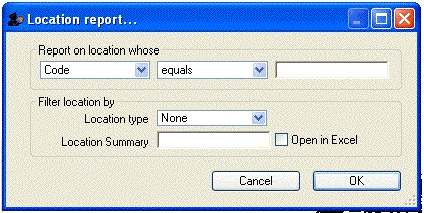 Number of items to include in report: Enter the number of items to be included in the report. Date range: Enter the dates you wish here. Each item will have its “analysis” field updated with the total value of sales during the period specified. Filters: Should you wish to apply filters to the report, three are available - for items, categories and departments. 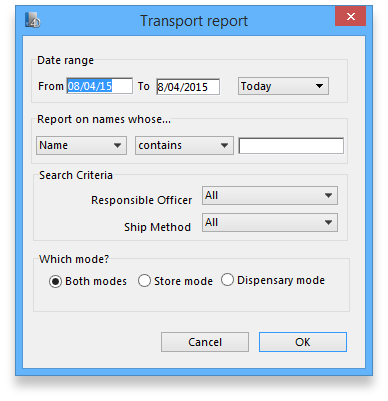 Which mode: You can choose store mode, dispensary mode or both modes of transactions for inclusion in the report. 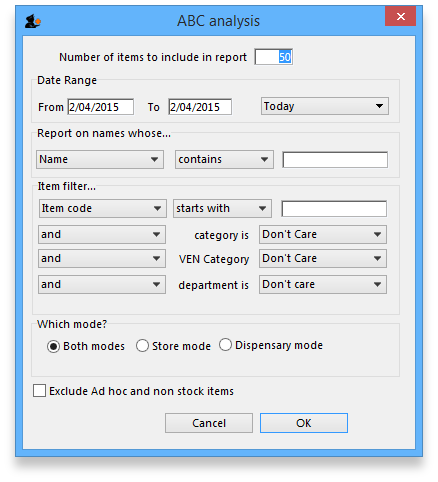 Exclude Ad Hoc and non stock items: If you check this box then Ad Hoc and non stock items will not feature in the report. The report lists the number of items specified, ranked by value of sales, starting with the highest. The value of sales and the percentage of the total value are also shown. Note that the total value is the total for the items in the report, not the total sales for all items. If you want to report on the total for all items, set the Number of items to report on to a number greater than the number of items in your data file (Note that this may make the report very long, but you can choose just to print the first few pages if you wish). This report is designed with line managers in mind, or other people who want to “keep their finger on the pulse” of their organisation but are not interested in the fine detail! The 10 items with the largest value of supply to customers in the date range chosen. The 10 suppliers from whom you have purchased the most in the date range chosen. The 10 customers to whom you have supplied the most in the date range chosen. The cumulative liability for expiring items for each of the next 12 months. Check this box if you want to view your report on screen first. Check this box to view the report directly in your chosen Spreadsheet program. All quotations shows the quotations in which Preferred is set to “true or false”. Preferred quotations shows only those quotations in which Preferred is set to “true”. Supplier option displays the quotation report on the basis of supplier.The quotations for the items related to a particular supplier are listed along with that supplier. Item option displays the quotation report with the items arranged in alphabetical order along with the corresponding supplier's name. limiting the report to suppliers meeting your specified criteria - e.g. the supplier's name code may be entered, so the resulting report will display only quotations from that particular supplier. 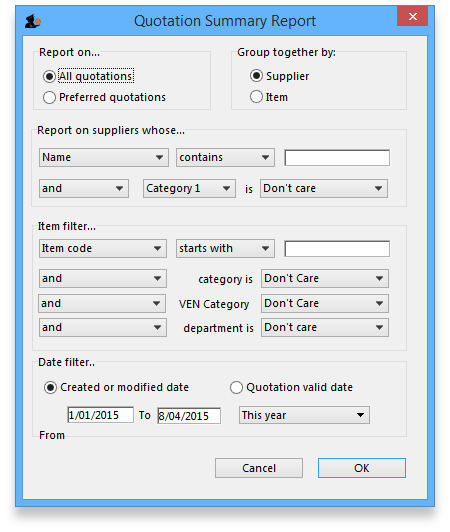 There is an additional filter, the Date filter, allowing you to specify the dates on which the Quotations you are examining were created or modified, and the radio button toggles display of the quotations' expiry date ( Quotation valid date ) on or off. This report allows you to to track remote site activity. It is available from the special menu. The report is only visible in the menu if you're on a primary server (the main server in a sync system). Select the required report by clicking on it. This report will produce a list of all debtors. mSupply uses an open-invoice system of accounting for debtors, so the outstanding amount for each debtor is displayed; for debtors with more than one invoice outstanding, the amount displayed is the cumulative total of all outstanding invoices. Note that the total outstanding on invoices is not reduced for any previous overpayment by a customer, but this is listed in a separate column in the report. 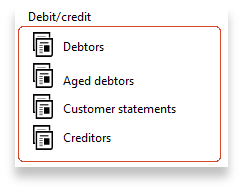 To remove overpayment amounts from the system, choose customer | new payment… and enter the name of the customer with an overpayment. You will be asked if you want to use the overpayment amount for this payment. Choose use, then allocated the overpayment to outstanding invoices. You will be presented with a window to find customers. If you want a report for all customers, leave the entry field blank. Click OK and a report will be produced for any customers who match the criteria entered. Note that customers with no amount outstanding will not have a statement printed for them. 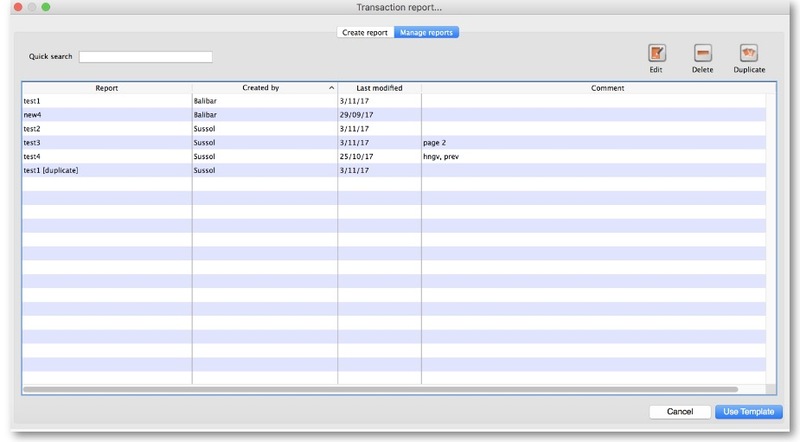 This report allows you to print information about the transport details for a range of invoices. First you are shown a window where you can select a date range and choose to report on only invoices supplied by a particular method, by a particular responsible officer, or to a particular name or names. Click “OK” to run the report. 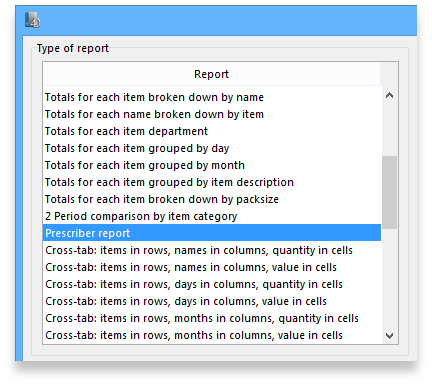 This report (v1.93 onwards only) allows you to view the total value, mean item value and item count for prescriptions dispensed for each prescriber. You will be shown a window with the normal date range options, and the option to report only on prescibers whose type field is set to a certain type. The window that appears is the Transactions report, but you will see that the Prescribers report is highlighted. As usual, the report options window is shown where you can choose the destination and set headers and footers. This report was initially made for use in dispensing situations where you want a quick count of the number of prescriptions and items issued in a day. However, it is also useful for getting a quick view of workload for a month or a year in store mode. 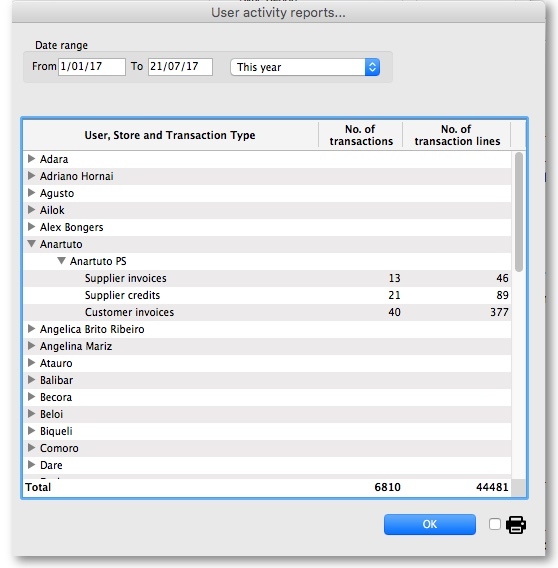 This report gives the number of supplier invoices (or prescriptions) and the number of stock lines on them, reported by user. Choosing this menu item shows a window like this (once you have selected a date range). You can drop down to view data by clicking on the green arrows. Alternatively, you can click on the printer icon on the bottom right and export the full list to Excel. You can either enter dates manually or choose from the drop-down list to the right of the date fields. Enter times here in 24 hour format (e.g.. 9:00 in the “from” field and 17:00 in the “to” field. Leaving these fields on 00:00:00 will calculate for the whole day. To calculate totals, click the Show button. If there are a lot of transactions to evaluate, a progress bar will be shown. Click the OK button to close the window when you are finished. This report shows a list of Items that are not available or insufficient stock is present to meet the requirements of the order placed by the customer. Information about the item code, item name, current stock, customer code, b/ord quantity is displayed. 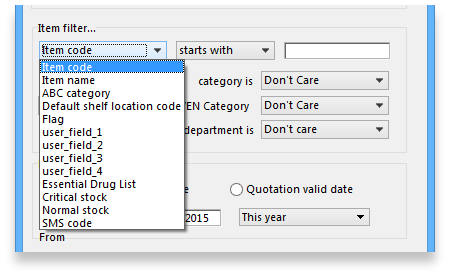 If you are running a backorder system this gives you a quick way to check if backordered items are now in stock so they can be supplied to customers. Note: the price list menu items are for those organisations that produce a price list or price indicator. (It is useful to call your publication a “price indicator”, as it implies the published price is a guide, and not a fixed price). You are asked to specify the number oftransactions and the number of months (e.g. 2 transactions in the last 3 months) that would make an item eligible for inclusion in the price list. A search is performed using the criteria you enter, and a list of items is shown that meet the criteria but are marked as not being in your price list. You can double-click on items in the list and click their “price list” check box to add them to the price list. This item updates the prices of items from the item line on hand that has the most stock. Only items whose “price list” check box is checked are updated. Each line of stock is evaluated to determine which stock line you have the most of. That line is used as the indicator price for its item. Note that if an item has no stock, then the price for that item will not be altered. It is a good idea to run the “suggest price list additions” report first. Only items that are marked as included in the price list (Item > Misc tab) are placed in a report, whether or not you have any in stock. 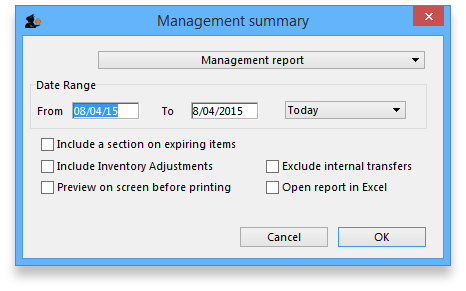 If you wish to export to a text file, choose “save to disk” in the report options dialog that is shown. If you wish to include different information, you can create a custom report to do this. This report is available in version 1.96 and later. The report may be restricted to certain locations by using specific search criteria. Choose either “Code” or “Volume” from left drop-down list is . The centre drop-down list allows you to choose a comparitor. You have to make an appropriate entry on the right-hand field. Leaving the field blank means no filter will be applied. It allows you to choose a location type. You can select the one from the drop-down list on the right side. The graphic of location type is shown below. For example, you can specify the location type“COOL” to show only refrigerated locations. Check the “open in Excel” checkbox if you wish to directly open the saved report in Excel (or any installed spreadsheet). 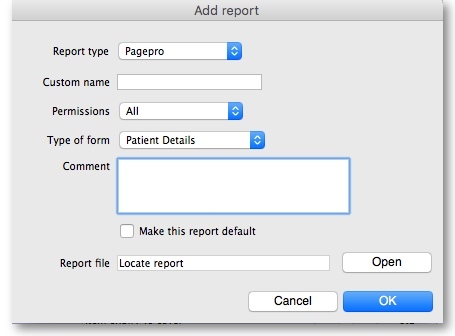 Click the OK button to run the report. The built-in reports may well be sufficient for your needs, but mSupply's versatility allows you to manage the reports to meet any specific requirements you have. the window that appears has already selected a name for your report, using the name of the in-built report prefixed by “ my_ ”; you may change this name should you wish. 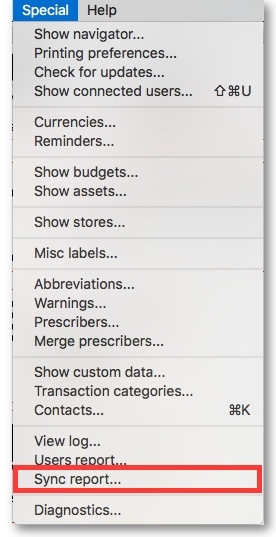 The Permissions drop down list allows you to specify users having access to your report; the options are All users , or Only me . 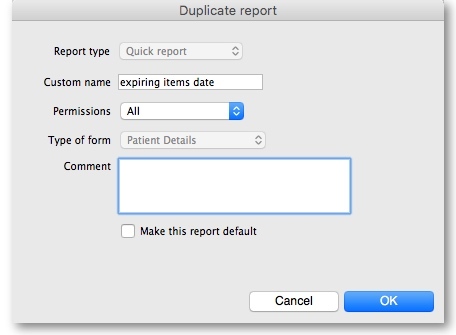 Should you wish your report to become the default one rather than the in-built report, then check the Make default checkbox. When you click on OK, the report you have just created now appears at the foot of the list of reports from the item on the menu Report>Manage reports.